If you ask someone to list the various fruits that they love to put in a smoothie, chances are they won’t include apples. That’s a real shame because apples can make an amazing addition to blended fruit and vegetable drinks. This is especially true for Ambrosia apples because they are sweet and crisp. To prove our point, we thought we’d share three amazing and very different fruit smoothie recipes featuring Ambrosia apples. Each one is scrumptious and a great way to boost your daily intake of essential vitamins, minerals, and soluble fibre. To get the maximum nutrients out of your smoothie – don’t peel your Ambrosia apples. Love to snack on a Ambrosia apple wedge with a peanut butter smear? Then you’re going to love this classic combination in a smoothie. Put everything in a blender and blend until smooth. You can also make this a smoothie bowl and top it with granola. This smoothie is as delightful to look at as it is to taste. Plus, it’s chock full of nutrients. Put everything in a blender and blend until smooth. Top with chia seeds. Get all of the best fruit of the Valley in one delicious drink. Put everything in a blender and blend until smooth. If you’d like it creamier, you can add yogurt. Enjoy. You may have noticed that these are all very different so there should be one to suit your mood or taste. 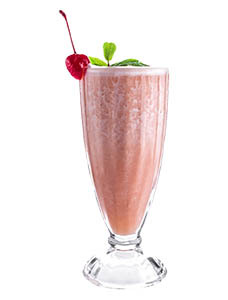 That’s the great thing about Ambrosia apple smoothies – there are so many possible recipes. What’s your favourite combination? Share it with us on Facebook, Twitter, or Instagram. Looking for more Ambrosia apple smoothie ideas? Check out this video from BC Tree Fruits for an Ambrosia Apple Blueberry Smoothie Bowl. Or this video from our archives. It’s a super healthy Ambrosia Apple and Veggie Smoothie.